LiveGrade offers multiple options when it’s time to export your looks to be used in post. They can be exported as a 3D LUT, as an ASC-CDL file or a camera format like ALEXA Look and AMIRA Look. Additionally Pomfort offers two formats to transport grading information between LiveGrade and Silverstack: Pomfort Looks and Pomfort Look Archives. Each one of all these formats has its own characteristics. You can also select “File>Save current Look as” to only export the look that is currently applied. 3D LUTs for Software: includes the CDL values and the Log to Rec.709 conversion LUT when created on the CDL Grade mode. If it has been created on the ACES mode, it has the IDT and ODT embedded in addition to the CDL values. Multiple export formats are available, which are described below. 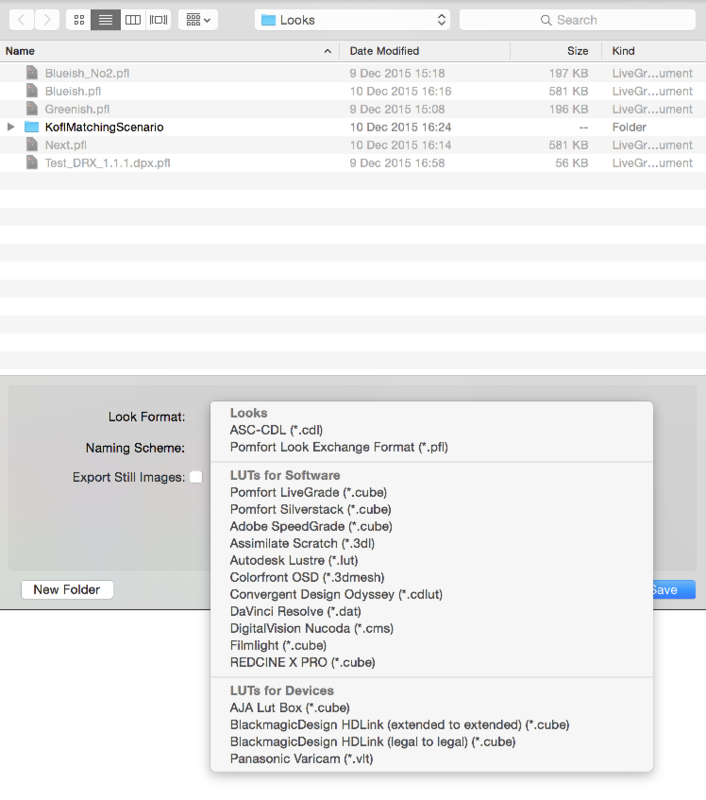 3D LUTs for Devices: includes the CDL values and the Log to Rec.709 conversion LUT when created on the CDL Grade mode. If it has been created on the ACES mode, it has the IDT and ODT embedded in addition to the CDL values. Multiple export formats are available, which are described below. Pomfort Look Exchange Format (*.pfl): It creates a .pfl file that can be used to transport looks to another LiveGrade or Silverstack instance. You can learn about transporting looks from LiveGrade to Silverstack in the article Transferring Looks from LiveGrade Pro to Silverstack. ASC-CDL: it creates a .cdl file containing the color values as specified by the ASC-CDL standard. It does not include the Log to Rec.709 conversion LUT. ALEXA Look: a .xml file that can be loaded on ARRI ALEXA cameras or used in post production tools. It includes the standard LogC to Rec.709 conversion LUT and the color values used on the ALEXA Look mode. AMIRA Look: an .aml look is created, which can be loaded on ARRI AMIRA cameras. It can be saved from grade created on the CDL Grade mode. It includes the cdl values and a neutral LUT. 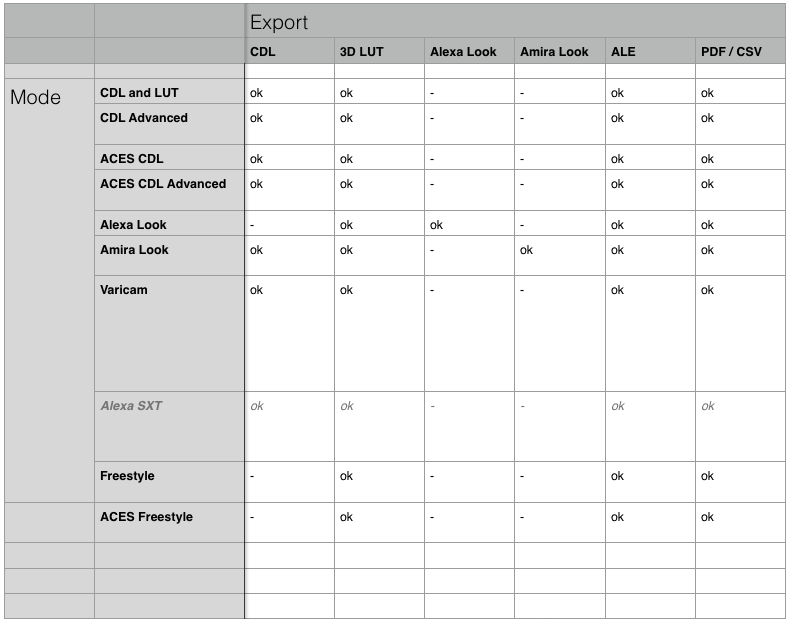 A custom LUT is included instead if a different one than the AMIRA LUT is used or the 1d LUT filter is modified. 4. Choose your desired destination on your hard-drive and hit “Save”. For more information about using naming schemes, please take a look at the article Using automatic naming schemes when exporting grades. 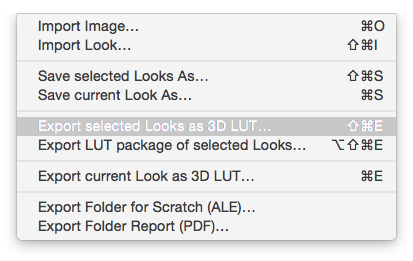 With this option, you can export a look to every available 3D LUT format. 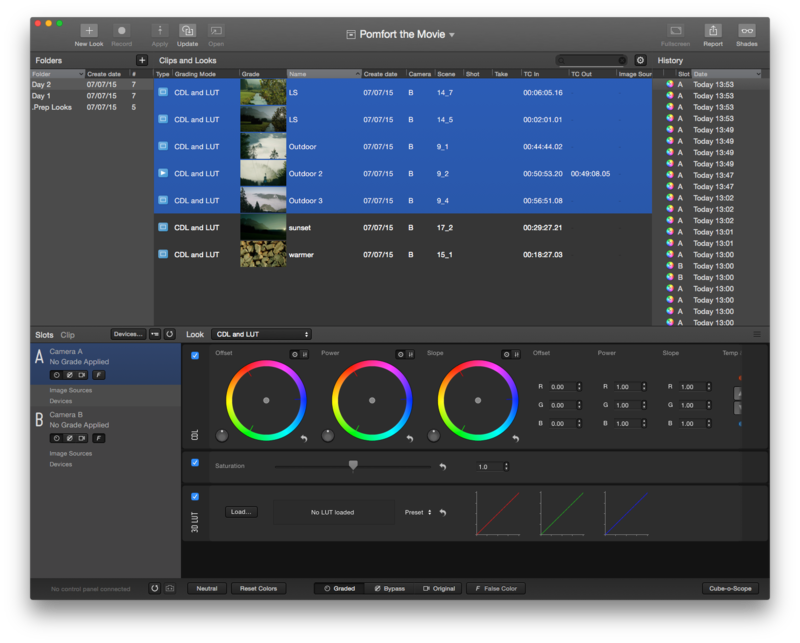 Just select the grades you have to export and then click on File>Export a LUT package of the selected Grade. Finally choose the save destination and a naming scheme (more information on Using automatic naming schemes when exporting grades). LiveGrade will create a folder with all the LUT formats of that grade. To import a Look Archive into LiveGrade go to the Main Menu. Choose “File > Import Look Archive” and select the desired look archive from the Finder. 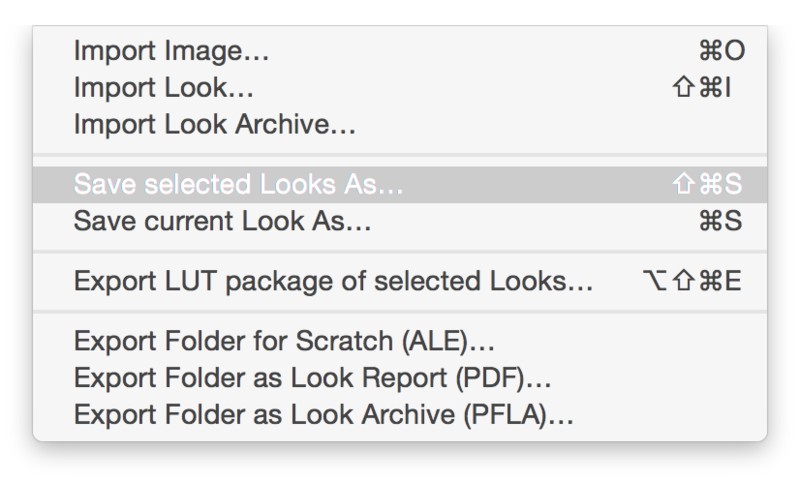 The look archive will be imported as a folder in the LiveGrade look library. You can learn how to handle look archives with Silverstack from the article Transferring Looks from LiveGrade Pro to Silverstack.